We’d love your help. Let us know what’s wrong with this preview of Service Design Patterns by Robert Daigneau. To ask other readers questions about Service Design Patterns, please sign up. As is true with all patterns books, your reaction might be, “I already know all of this”. This book doesn’t try to identify new ideas. Instead, it gives a name to the approaches we’ve all been using for some time, and lists their pros and cons. It’s cool that the author identified names that were, in many cases, useful for both RESTful and SOAP style services. The code examples are helpful, but aren’t detailed or prescriptive “how-to” recipes. The author hints in the forward that you should proba As is true with all patterns books, your reaction might be, “I already know all of this”. This book doesn’t try to identify new ideas. Instead, it gives a name to the approaches we’ve all been using for some time, and lists their pros and cons. It’s cool that the author identified names that were, in many cases, useful for both RESTful and SOAP style services. The code examples are helpful, but aren’t detailed or prescriptive “how-to” recipes. The author hints in the forward that you should probably have an understanding of or an acquaintance with the technologies and frameworks that are used. Fowler also suggests in the forward that there are many other books out there for that type of thing. GoodReads ask you to identify the date you finished it. To be honest, I haven't read each and every page because the book clearly isn’t meant to be read cover to cover (it's pretty heavy reading), it’s more of a reference that you might look to when you need a nudge on the decision factors to consider. Still, I've read enough to evaluate it. 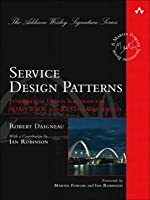 Most patterns books contain very little new information, usually they just provide terminology for things an experienced developer has seen or done countless times. As such, I admit it is somewhat unfair for me to feel the way I do about Service Design Patterns: that contains staggeringly little new information for an experienced developer. I knew not to expect to learn a great deal, but I still managed to find even less information than I expected. I think about 70% of the book will be immediate Most patterns books contain very little new information, usually they just provide terminology for things an experienced developer has seen or done countless times. As such, I admit it is somewhat unfair for me to feel the way I do about Service Design Patterns: that contains staggeringly little new information for an experienced developer. I knew not to expect to learn a great deal, but I still managed to find even less information than I expected. I think about 70% of the book will be immediately recognizable to anyone who has done any web service work before, and it won't particularly be new terminology, it's generally the standard terminology present in virtually any documentation. This is not to say it's a bad book; it's not bad, it's actually very well-written, well-organized, and very clear. The problem is that there simply doesn't seem to be enough material for an entire book here, and it often feels like the text is padded with common knowledge. There were two things that really irked me about the book. One was that it contained mention of Resource API as an approach to designing a web service API, but contained very little about REST beyond the absolute basics. I realize entire books have been written about properly designing RESTful APIs, but as I mentioned this book feels padded, so it could have easily stood a more thorough treatment. My biggest complaint with this book was its treatment of the issue of web service versioning. Versioning web services is mentioned, and the reasons to do so are enumerated, but very little guidance is provided for how to do so effectively. In my experience, properly versioning a web service API is one of the most challenging aspects of designing such an API. Obviously it's not difficult from the perspective of the external API itself, you just throw a version number in the URL or something, but it's very challenging in implementation. If you're at version 10 and a request comes in for version 3, what do you do? Do you have a request mapper for 3->10, process, and then a response mapper for 10->3? If so, then introducing 11 means writing 20 converters. Do you just write a 3->4 and a 4->3 when you introduce 4, then chain them together? It's all very complex and difficult to do properly, and I was hoping for some practical guidance. But instead, it has one of the weakest treatments in the book, without even the level of source code present for even trivial patterns elsewhere in the book. 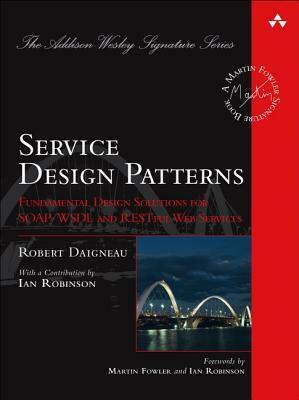 The book explores several design patterns related to creating web services. The design considerations for picking each pattern is explored, covering concerns such as complexity, encapsulation, long-running tasks, stateful services, integration contracts, discovery, versioning, and evolving extensibility. It's not judgemental, and lets you decide for yourself which is the best use-case for each pattern. The code examples are not too useful. I'd prefer more flow/component diagrams myself. The book p The book explores several design patterns related to creating web services. The design considerations for picking each pattern is explored, covering concerns such as complexity, encapsulation, long-running tasks, stateful services, integration contracts, discovery, versioning, and evolving extensibility. It's not judgemental, and lets you decide for yourself which is the best use-case for each pattern. The book peppers references to the Gang of Four's Design Patterns, but as long as you have some experience/pain points in drafting web service interfaces, and roughly know what Factory pattern means, it's possible to infer what the author meant. For anyone who is building web services for the first time, this is a great book to learn about all the pitfalls of different architecture decisions. While a 5 to 10 year software engineer may know some of this due to experience, this book still has a lesson or two to teach any veteran. This book is pretty good place to start if you're still new to web services and design patterns. But I stress the word *start*. If you've done any significant work in this area and aren't confused by the acronym GoF then you should probably skip this. You won't learn anything new and you'll probably be annoyed that some of his guidance is given no real context or in-depth discussion or even decent justification. A lot of good ideas here, but the language/environment choices (Java/C#) are very different from my native tongues, so was hard to find the wheat in the chaff. This book should have been a nice complement over Enterprise Integration Patterns, but in the end, it's not. I have a mixed feeling about this book. It misses the Pattern Language philosophy or even the Design Patterns concept at all. The author is looking for covering the field as well as possible. In the end there is some useful stuff out there, such as clarification of what can be used in what situation. It makes this book not that useless.